Making what is essentially a prequel to one of the most beloved films of all time is a risky business. “Oz, The Great and Powerful” gives us the story of how the titular wizard in “The Wizard of Oz” got to where he is when Dorothy meets him. It’s not a perfect film by any means, but it has all the magic and charm we can expect from a Disney film. Oscar (James Franco) is a sideshow magician in a travelling circus. He’s more than a bit of a ladies’ man, a con artist used to lying and manipulating to get what he wants. When he winds up on the run in his balloon (from an enraged boyfriend of one of his recent conquests), he’s sucked up into a tornado and winds up in Oz. There, he meets Theodora (Mila Kunis), who tells him he’s obviously the wizard spoken of in a prophecy made by the last king, who was poisoned by the Wicked Witch. When he learns that the wizard gets to be king and have vast amounts of gold, Oz is in. Of course, it turns out that things are way more complicated than he thought. The Wicked Witch he sets out to kill (Michelle Williams) isn’t who he thinks, Theodora’s sister Evanora (Rachel Weisz) is suspicious of his credentials, and the people of Oz are far from the army one really needs to defeat a powerful witch. Franco gets off to a somewhat rough start, with the pre-Oz material feeling a bit off kilter. Once the film hits Oz, however, he hits his stride – and I found myself wondering if maybe the pre-Oz material is intended to feel strained. Regardless, Franco makes his con man character someone we can root for even while he proves over and over that he’s not a very good person. He has a decent heart, but ultimately he subsists on tricks and lies. The women all commit to their roles 100%. Kunis and Weisz get to chew a bit of scenery, and Williams’ talent shines even with the fairly simple role she’s given. The special effects are impressive, especially those requiring motion capture. China Girl (Joey King) is a small girl made out of china whom Oz rescues early on. She insists on going with him, and it’s almost immediately easy to forget that she’s entirely computer-generated. Apparently the actors were actually on set for all the motion-capture work, and their facial reactions were used by the computer animators. Likewise, Zach Braff’s turn as Finley, a winged monkey who becomes Oz’s lackey, is surprisingly lifelike – due mostly to the excellent facial expression work. The Land of Oz itself is almost a character in its own right, and the effects don’t disappoint here, either. Strange plants and animals, glorious vistas, and the Emerald City are all reimagined in a way that references the Judy Garland film without simply copying it. There are also heaps of little nods to that earlier film, so its fans will likely be pleased. This being a Disney film, I probably don’t have to point out that it’s full of unfortunate, old fairytale tropes – good people are beautiful, evil people are ugly (or get turned ugly by the end); you need a man to lead an army; women with real power are evil; etc. For most viewers, the charm of the film will likely overwhelm any negative reaction to these common issues, but for some they’ll be dealbreakers. 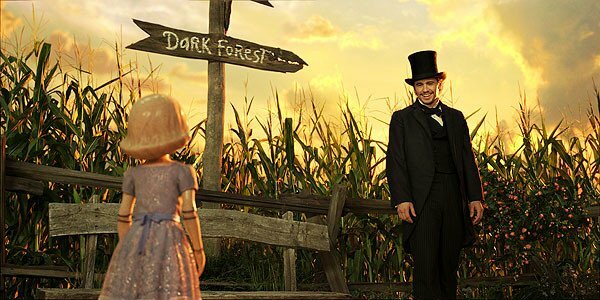 So, if you want a charming and beautiful film that’s a fairy tale about the man who becomes the Wonderful Wizard of Oz, do not miss “Oz the Great and Powerful.” If you’re hoping for a stereotype-smashing, progressive version of Oz (in other words, one faithful to the feminist themes of L. Frank Baum’s books), you should probably stay away.